aman singh, aman singh das, Better Business Bureau, brand management, Brand Management, Business, Career advice, careers in CSR, cause marketing, consumer education, corporate citizenship, corporate social responsibility, corporate values, CSR, CSR blogger, CSR communications, CSR strategy, Edelman, employee engagement, Events, Green practices, Jobs in CSR, Leadership, leadership, management, Management, Michael Holland, philanthropy, PR, shared value, social responsibility, Social Responsibility, Stakeholder Engagement, sustainability, what is CSR? Edelman’s EVP for CSR-New York, Michael Holland while highlighting his firm’s approach, emphasized that corporate responsibility was emerging increasingly as an indelible part of brand management for companies, although North American companies, while initially slow to embrace it, were quickly getting on board. Defining CR as “A belief system for a company” he broke its significance for companies into three segments: 1) the social and legal aspect; 2) its immersion into the operational model; and 3) how to leverage it for competitive share in the marketplace. What is the ROI for corporate responsibility? Citing a recent survey conducted by McKinsey, Holland said that the business case for corporate responsibility had never been clearer for companies. “Companies that paid attention to CSR in the last three years reported an increase in their share price of 43% against a 12% increase for those who didn’t.” At the same time, profits for the first segment of companies increased by 16% versus 7%. I’ve often noted that metrics and numbers speak louder than words. These then, need no further explanation. See more results from the McKinsey survey. What is corporate responsibility all about? I have discussed in the past the huge difference between conducting brand management and reputation-building and immersing CR as a culture of change into your company’s strategy. I asked Holland how he advises clients to walk that fine line. Now, with several communications firms announcing CSR practices, where are we headed with the confluence of PR, brand management and CSR? I turned to the latest entrant in the field, Ruder Finn. Take a read. Last year, Accenture co-produced a report with the United Nations Global Compact titled A New Era of Sustainability: CEO reflections on progress to date, challenges ahead and the impact of the journey toward a sustainable economy. 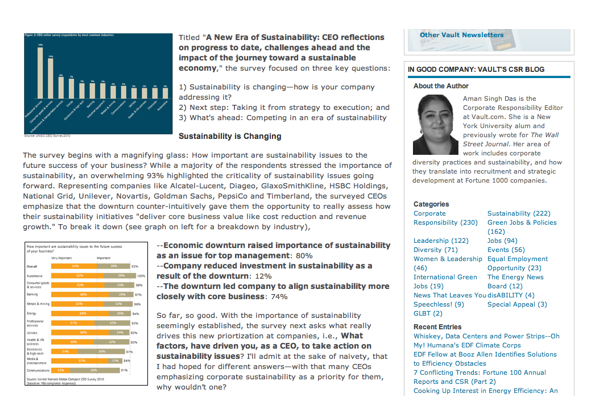 The report focused on examining three main questions with 766 CEOs serving as respondents: 1) Sustainability is changing—how is your company addressing it? ; 2) Next step: Taking it from strategy to execution; and 3) What’s ahead: Competing in an era of sustainability. The BIG finding from the report: 93 percent of 766 CEOs surveyed believe that sustainability will be “important” or “very important” to the future success of their company. Now, Accenture has produced a followup sector by sector report that offers more clarity — and a wide disparity in this percentage — to the overarching aggregated data by doing a deeper dive by industry. As for the communications sector, the percentage of executives seeing sustainability as “very important” to future growth drops to a mere 22 percent. The new, follow-up report, adds teeth to this initial observation by showing a disparate practice of sustainable business practices across industries. Is sustainability measurement finally becoming accepted standard practice? I would add that it is also a mindset: A mindset that understands that business goals (profits, profits, profits) cannot be reached without taking into account the society and the environment you operate in and the human capital that helps you succeed. Will the rest of the sectors detailed in Accenture’s report follow through on their CEOs’ ambitions? In coming months — and years — with America’s long-term sustainability as an economic power in question, all eyes will be on whether American businesses can pull up their socks and return their operating base to trustworthy status by using sustainability as a guiding principle. Where government fails, business steps in, right fellow #csrchat attendees? Thoughts? Don’t forget to leave a comment or connect with me @AmanSinghCSR. Next: Gib Bulloch, Executive Director of Accenture Development Partnerships discusses the report in Capabilities for the Convergence Economy. Most recently the Editorial Director at CSRwire, a digital media platform for the latest news, views and research on CSR and sustainability. Along with leading content distribution, social media strategy and CSR/sustainability reporting services for CSRwire members, I also led Talkback, CSRwire’s Commentary section, with over 250 contributors and increased traffic 35% – 50% year to year. The channel featured several influencers and thought leaders – John Elkington, Hazel Henderson, Wayne Visser – as well as authors – Frances Moore Lappé, Bob Willard, Carol Sanford – researchers, activists and CSR/sustainability professionals – AMD’s Tim Mohin, Campbell Soup’s Dave Stangis, Sustainability leader Peter Graf, John Edelman – and served as a platform to push the needle on critical topics, learn from each other and constantly crowdsource new ideas, partnerships and best practices. While at CSRwire, I’ve had the pleasure of working with numerous Fortune 500 companies as well as the country’s leading nonprofits and academic institutions on creating and implementing communication strategies focused on stakeholder engagement and behavior change, including Unilever, Verizon, Aramark, SAP, Campbell Soup, Nestle Waters North America, McDonald’s, General Mills, HP, Mars, Avon, Sodexo, EarthShare, Points of Light and others. Our Stakeholder Engagement Campaigns – including live Twitter chats and webinars as well as content series and multimedia – generated millions of impressions, hundreds of participants and provided our members with critical feedback, important partnerships and a pulse of their stakeholders’ concerns. I’ve also been an active journalist for almost 15 years, including stints at The Wall Street Journal, The Villager, Tehelka.com and Vault.com, where I created, designed and managed the recruitment industry’s first CSR channel aimed exclusively at engaging, debating and discussing corporate social responsibility, sustainable (and unsustainable) business practices, responsible (and irresponsible) leadership, diversity and the lack of it, the role of workplace culture in our lives, social entrepreneurship, the newly-minted term ‘intrapreneurship’ and much, much more. Skepticism is second nature to me and I’m most comfortable asking [mostly the right] questions, facilitating dialogues, editing copious pages of text, refining even the most academic articles into easy-to-read blogs and thrive on the opportunities extended by a new world of social media and access to organizations and change makers. This is my space – to question, analyze and discuss. I’ll examine the latest CSR report and debate how we’re faring in our pursuit of materiality and creating a new economy built on wellbeing and shared value. No question is small enough, no development unrelated. And no topic unworthy. From careers in CSR to the future of GRI reporting, from analyzing the do(s) and don’t(s) of sustainability to the latest in impact investing and our search for materiality; from social media etiquette to transparency in this new hyper-connected world, from work/life balance to gender and age discrimination, from effective communication strategies to the immensely irritating term “greenwashing”; and much much, more, join me for a promising and thought-provoking ride.